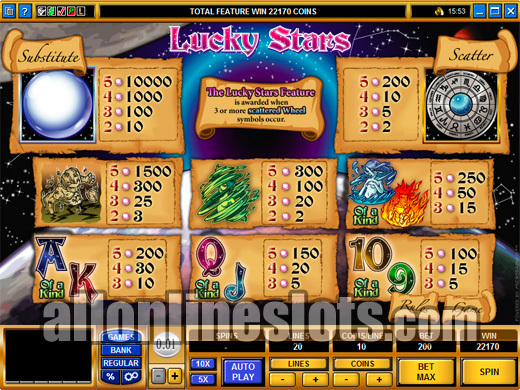 Lucky Stars is a horoscope theme video slot by Mcirgaming. 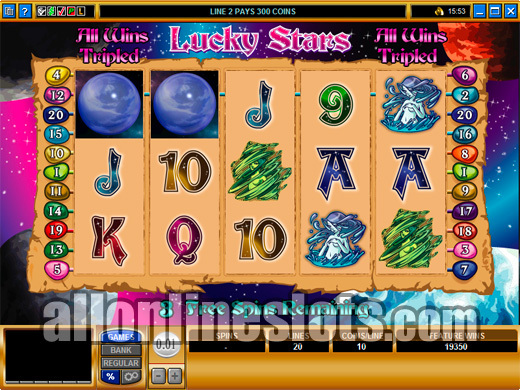 It uses the popular five reel, twenty line format and gives you the option of betting up to 20 coins per line. It has a multi-stage bonus feature and a top line win of 10,000 coins. 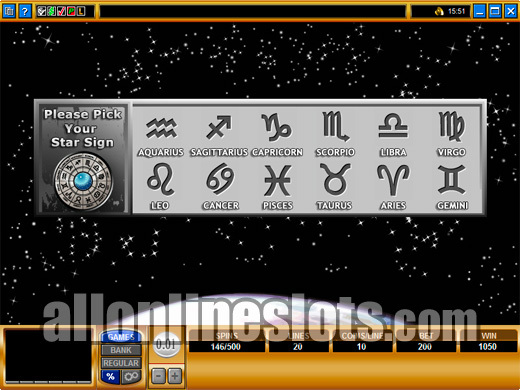 If you are a believer of horoscopes and star signs then you will love the Lucky Stars video slot as it has a great star sign theme. It also has a nice 10,000 credit top jackpot and a multi stage bonus feature where you can win free spins or a shot at the pick a box style bonus. 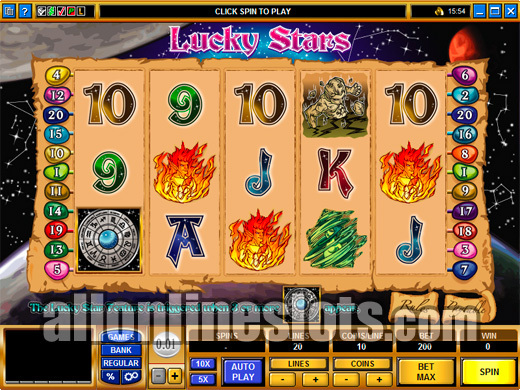 Lucky Stars uses the 5 reel, 20 line layout that has become very common with video slot machines. You can bet between one and twenty credits per line so you have a 400 credit maximum bet. All wins are multiplied by your line bet so the more credits you play the more you stand to win. On the reels the five most important symbols are the wild globe, earth, wind, water and fire. The globe substitutes for all other symbols and awards the top pay if you line up five. 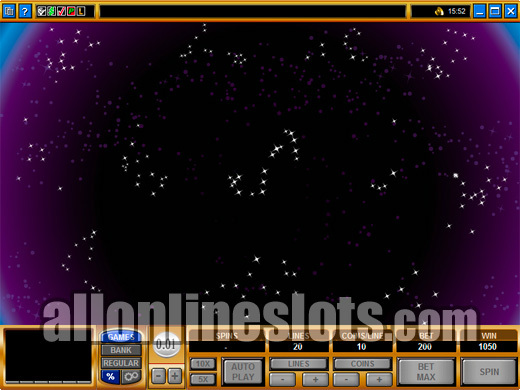 This jackpot is 10000 credits multiplied by your credits per line - at max bet this pays a huge 400,000 coins. The globe also acts as a wild multiplier for any win it is a part of with the exception of the five wilds. The next highest pays after the five globes are 1500 for five Earth symbols, 300 for five wind symbols and 250 for either five water or five fire symbols. All of these wins can be doubled if a wild is part of the win and all are multiplied by your line bet of up to 20. The scattered wheel is your ticket to the bonus game. As usual hit three or more anywhere on the reels and you win the bonus. The first stage of the bonus presents you with all of the star signs. Select one and you move on to a Wheel or Fortune style stage where you click Spin to start the wheel. 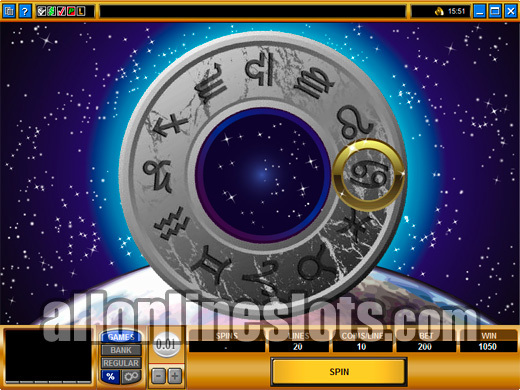 If the wheel lands on a star sign you did not select you are returned to the reels for 7 free spins with all wins tripled. If the wheel lands on the star sign you selected you have a choice of an additional 15 free games or a shot at the pick a box bonus. You can only select one. If you pick the free spins you are returned to the reels where you get 22 free games with all wins tripled. If you select the pick a box bonus you move on to the next stage. Here you are presented with twelve constellations. Pick five to reveal your prizes (Screenshot). After you have picked you get your total prize plus you get the original seven free spins. Lucky Stars is definitely a game for those who follow the stars. With a possible jackpot of 1,200,000 coins during the free spins and a great multi stage bonus feature it can be seriously rewarding.